Deborah Milano Gold Pochette is an elegant beige fabric pochette sporting gold flecks and trimmings. Give your eyes a dramatic look on the go with 24ORE Absolute Volume Mascara + Black Kajal Pencil in this pochette. Deborah Milano 24ORE Absolute Volume Mascara (12ml):An ultra-volumizing water-resistant mascara. Its waterproof formula ensures an immediate volume with an extreme seal. With a pool of film-forming polymers for a perfect adherence of the texture to the eyelashes. The maxi applicator wraps and separates the eyelashes for a "mega volume" result. Deborah Milano Black Kajal Pencil (1.5 gm): A soft and ultra-smooth texture that can also be applied inside the eyelid rim of the eye. 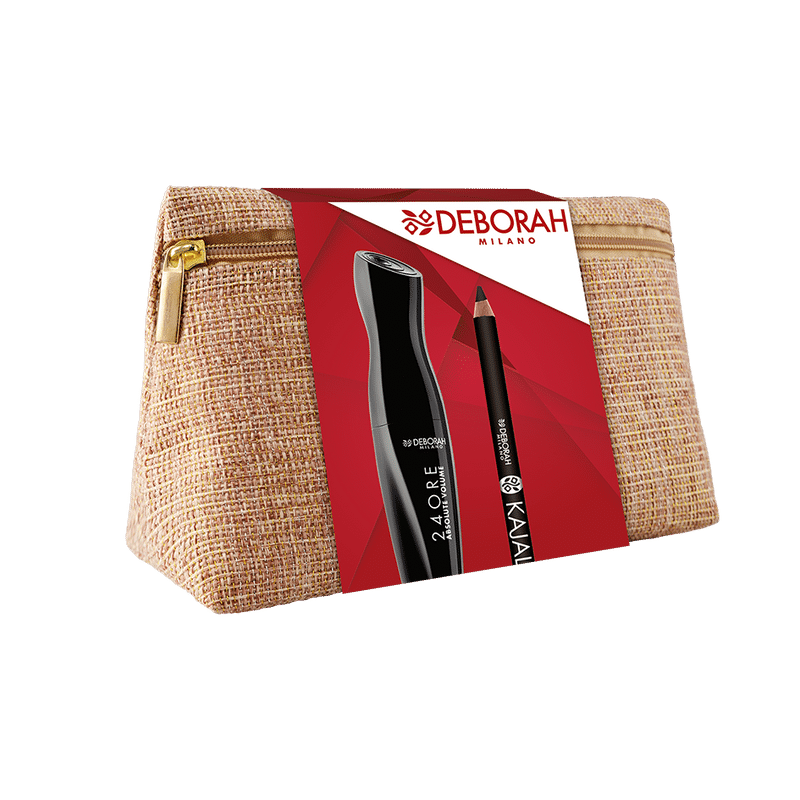 Soft pencil with an intense color that can be applied on the inside as well as outside of the eye. Additional Information: Italy's leading make- up brand, Deborah Milano embodies Italian excellence since 1962. For over 50 years Deborah Milano has been making beauty an affordable and accessible pleasure for all women. Combining a flair for colour, latest trends and a focus on quality certified by the Deborah Group's own research laboratories, the brand's eye catching designs, attention to detail and unmistakably Italian flavour have become its hallmarks.